I was told a pack of lies by serial liar John Satchwell who arranged the cull of Canada geese on his park himself, as well as that on Dartmouth park where his son of the same name is project manager, but to what extent did his junior staff conspire with him to present a pack of lies to myself after gate crashing the cowards rounding up of geese at Victoria park Tipton on July 10th 2013? I was told that the geese were released, by senior countryside ranger Matt Darby. If he is now back peddling on this and the geese were not released, but executed as the council now claim, then I was lied to. 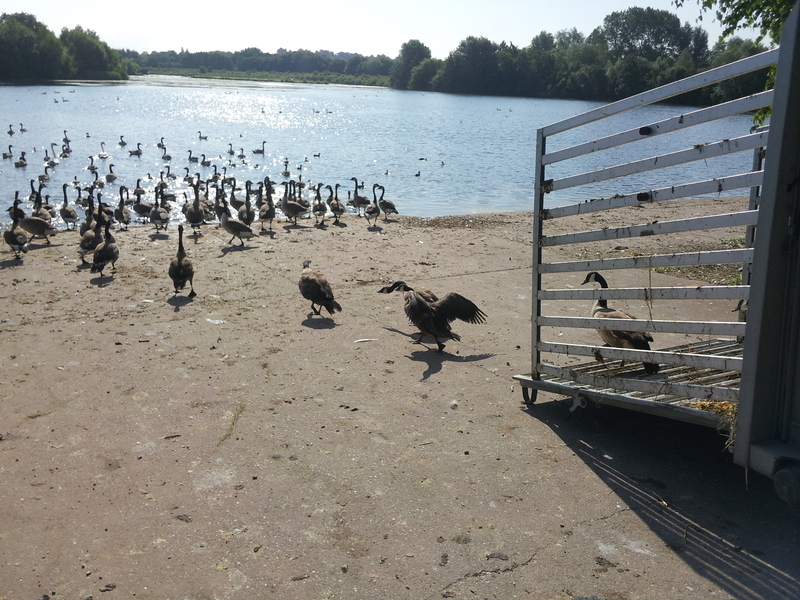 I WAS LIED TO, AND BY DIRECT STATEMENT, SANDWELL COUNCIL ARE CALLING ME A LIAR IF THEY CLAIM THAT I WAS NOT LIED TO ABOUT THE RELEASE OF GEESE AT FORGE MILL LAKE. 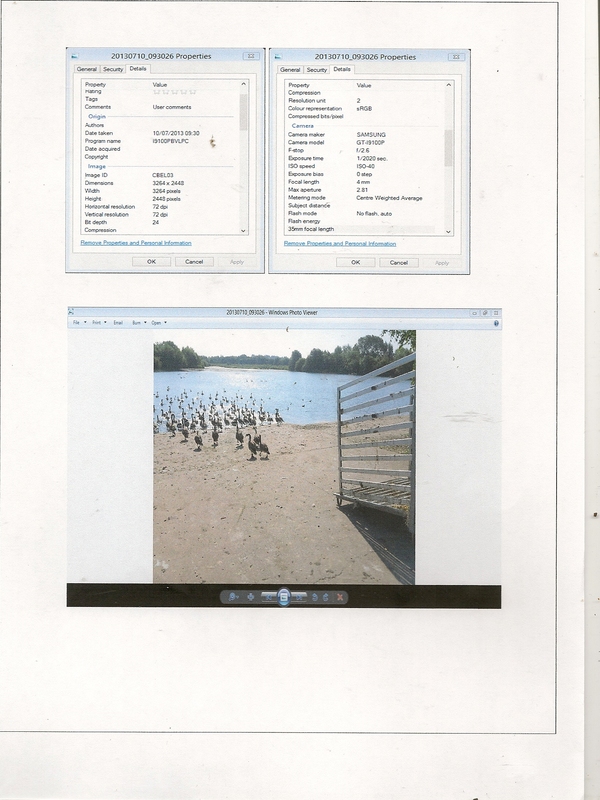 IT SHOULD ALSO BE STATED THAT IF GEESE WERE RELEASED AT FORGE MILL LAKE, AS APPEARS TO BE SHOWN IN THE PICTURES, AND IN THE VERBAL TELEPHONE CALLS TO MYSELF, THEN THEY HAVE ALSO NOW LIED TO WEST MIDLANDS POLICE. Release of geese July 10th 2013. Last year I contacted you following the rounding up of Canada geese in Victoria park Tipton, which myself and others directly observed taking place. I was told by contractors PESTEX and John Satchwell Senior that they were being “relocated” to the Sandwell Valley. Though I did not believe this at the time, I thought that knowing you for some years that I would at least get the truth from you if this had indeed happened, and that the birds were not as I suspected being rounded up for slaughter by these pest exterminators. I asked you in a phone call if you could take some pictures to prove that the birds had been released. You also appeared to know very little about this arrangement of birds being delivered to the Sandwell Valley. In this phone call conversation, I asked you if you had seen the birds released at Forge Mill lake by Pestex, and your replied that you had. I asked you how many had been released and you were unsure as “they had all run out quickly” from the Pestex trailer in which they were contained. You stated that you had taken some pictures on your mobile phone of this and would send them to me via email later that day. On this same day, I did indeed receive an email from yourself containing 3 picture attachments. These were numbered 2013710_093021, 2013710_093023, and 20130710_093026 respectively. The location of this picture is unmistakably Forge Mill Lake, would you not agree with this? There are geese exiting the trailer at the ramp part of the lake, with other geese appearing to be in the water as you stated they were when taking the pictures on your mobile phone, would you not agree with this? The geese would appear to be running out at speed as though spooked by something, and also appear to be a little dishevelled as a result of being contained in this trailer, would you not agree? They are clearly shown in the picture heading for the water to get out of harm’s way, would you not agree? On clicking the properties of these 3 attachments, it reveals that picture 1 numbered attachment 2013710_093021 was taken from a Samsung camera – model GT-I9100P at 9.30 a.m.
Picture 2, numbered attachment 2013710_093023, and was taken from a Samsung camera -model GT-I9100P at 9.30 a.m.
Picture 3 numbered 20130710_093026 was taken from a Samsung camera -model GT-I9100P at 9.30 a.m.
Can you confirm that you took these pictures from a Samsung Camera- model GT-I9100P on the date and at the times taken at Forge Mill Lake West Bromwich? Could you further confirm that the email address mathewrdarby@gmail.com sent from what I assume to be a mobile phone on 10th July 2013 at 11.15 a.m to your Sandwell . Gov email address matt_darby@Sandwell.gov.uk was/is yours? Can you confirm that you sent this and the picture attachments 2013710_093021, 2013710_093023, and 20130710_093026 from the mobile to another computer source? Can you also confirm that you then forwarded this email from the Sandwell .gov address matt_darby@sandwell.gov.uk to my own email address, which was sent at 11.19 a.m on 10th July 2013? Could you please explain exactly what you saw on this day 10th July 2013, what you were asked to do on the day regarding the arrival of geese at Forge Mill/Sandwell Valley, who instructed you to do this and if this had been prearranged before 10th July 2013, or hastily arranged on the day itself? 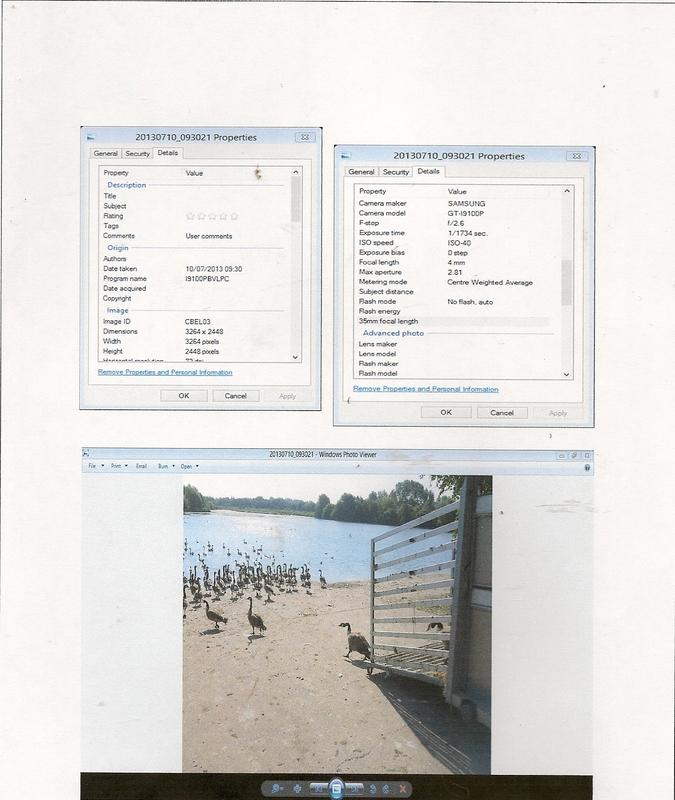 states that “NO-ONE WAS LIED TO.” This follows my own FOI request where it appears that Sandwell council carried out a clandestine cull of Canada geese at Forge Mill Farm in 2013 and again this year, rounding up birds from Victoria Park Tipton and Dartmouth Park West Bromwich. Were you Matt telling me the truth, as I suspect you were on 10th July 2013, when you sent me the email containing 3 attachment pictures of geese numbered 2013710_093021, 2013710_093023, and 20130710_093026 respectively taken from your mobile phone Samsung model GT-I9100P clearly being released at Forge Mill lake from a parked trailer near the ramp? 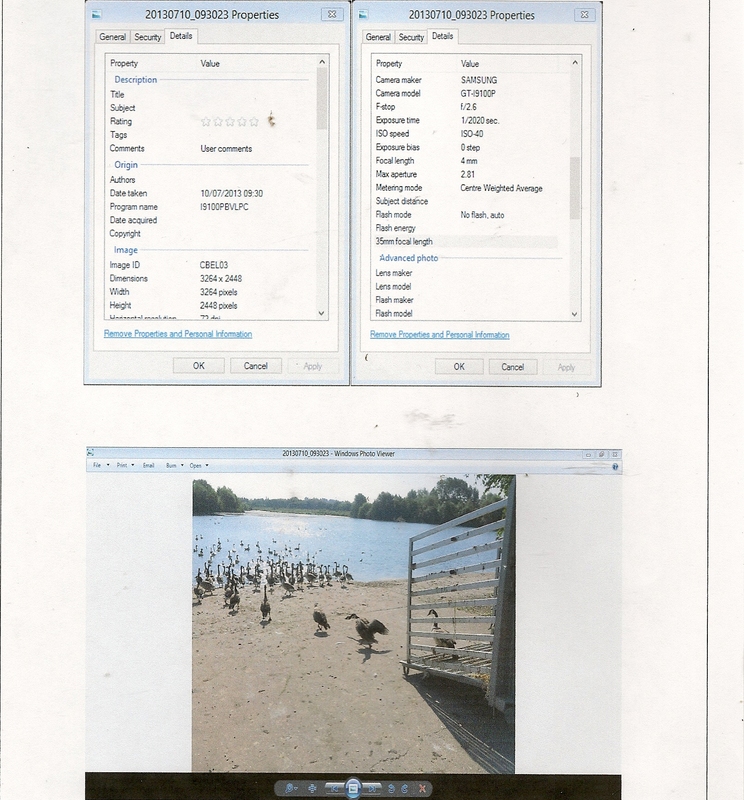 Can you also tell me the truth as to if these birds were then re-rounded up and killed, between 0930 am when you took the pictures and 11.15 when you sent the email pictures to yourself and then forwarded them to me at 11.19, and if this was the case then I am afraid that I was not told the truth at all and wonder what exactly you or others thought would be gained by lying to myself as to the fate of these birds? The truth will always come out, and I would very much appreciate that you give me the facts as they stand without protecting others who have landed you in this unwarranted situation which I firmly believe was not of yours, or anyone else at Sandwell Valley’s making. 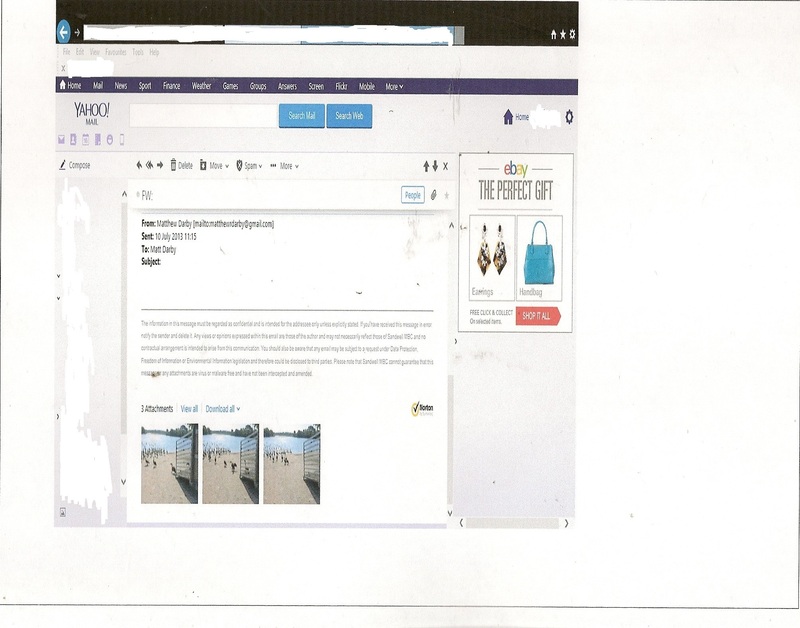 Confirmation of email sent by Matt Darby 10/7/2013 from his Sandwell.gov email account. 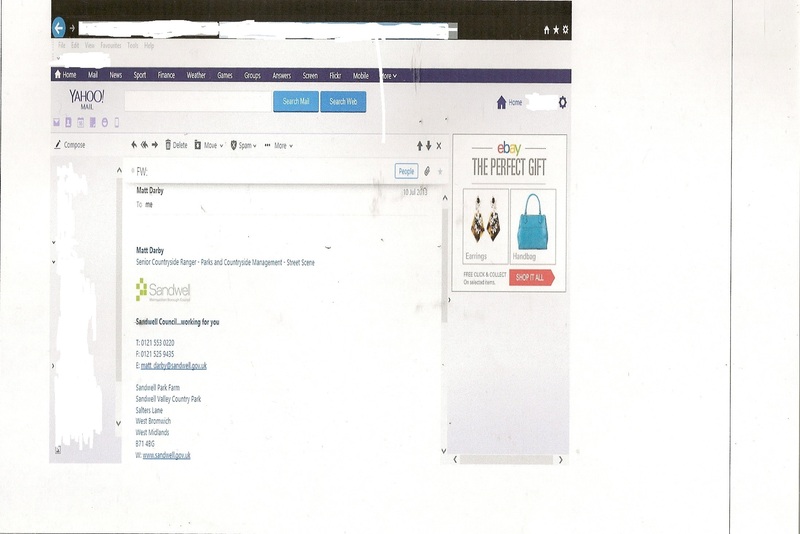 Confirmation of email sent from Mathew Darby’s email account to Matt Darby’s Sandwell.gov account at 11.15 am 10/7/2013, which contains the 3 picture attachments. 06.14am First see Pest controllers on Victoria park Tipton. 06.39 am Pest controllers start to leave Victoria Park Tipton, supposedly to “relocate” geese to Forge Mill Lake Sandwell Valley. It would possibly take another 15 minutes to lock up the gates in Queens Road. Another 30 minutes maximum to reach Forge Mill Lake- if we are to believe this is where the birds were taken to. 09.30 am Matt Darby takes 3 pictures of geese being released at Forge Mill lake from the truck that they were supposedly released from. At least 2.5 hours have now passed since the birds were rounded up and contained within the truck, if we are to believe that the birds were released. If they were contained for this length of time we believe that this contravenes the Animal Welfare Act 2006, as does the manner in which the birds were transported. This law, according to Natural England applies to Canada geese when caught, regardless of where they are being taken to or their prospective fate. SO WHAT REALLY OCCURED BETWEEN 07.30AM- 9.30 AM ON 10TH JULY 2013? Were some geese that were on Forge Mill Lake enticed into the trailer, only for Matt Darby to then take some phoney pictures to send to me later? From the look of the birds that are near the lake edge, I do not believe this. From my experience they appear to be like birds that have been contained for a period of time and then slightly confused as to where they are, in new surroundings. They do appear to be running out, as Matt Darby told me that they had. 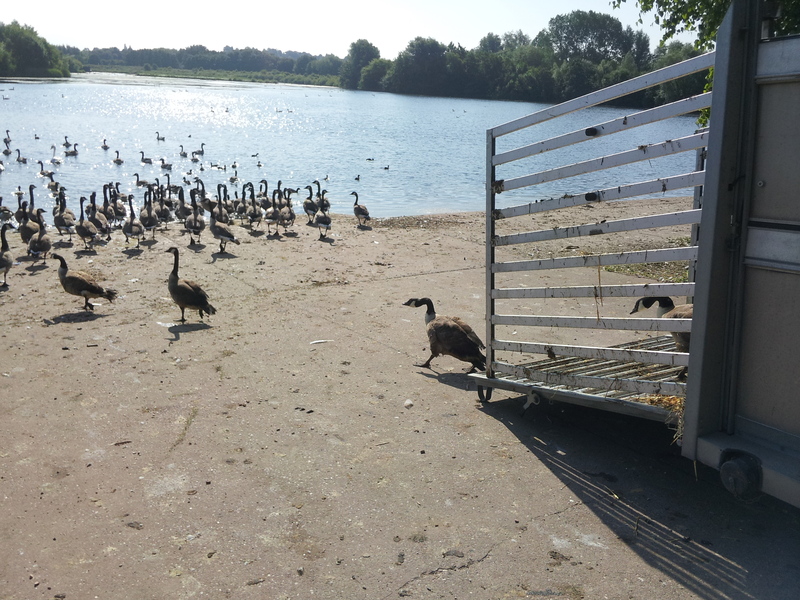 I do not believe it feasible that the geese would walk into a ramp trailer like this, unless they had been herded in there, as they had at Victoria park. Look at the height of clearance up to the trailer ramp. 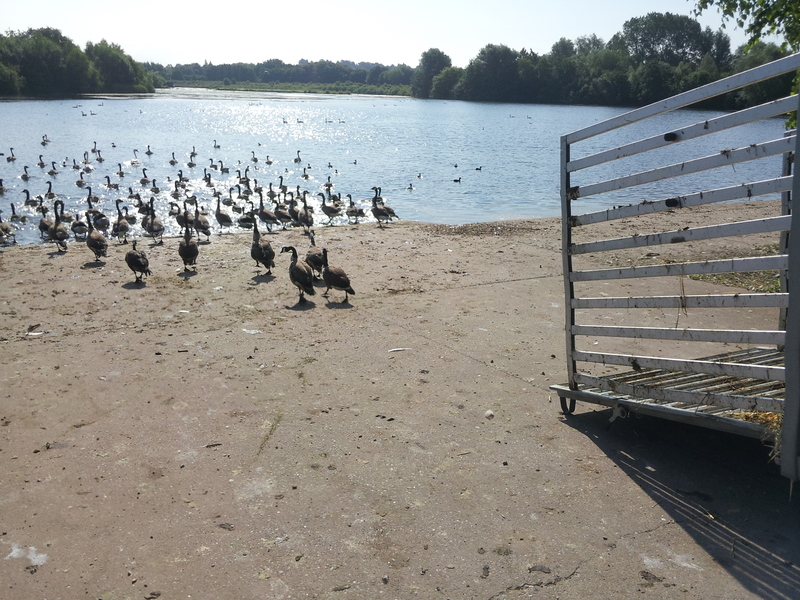 There is no fencing around at Forge Mill lake ramp, so it appears that the birds could only have appeared out of the back of the trailer, rather than walking up into it and then exiting quickly. The ramp gate appears soiled with feathers, excrement and straw, which gives some idea as to what was happening inside the trailer for the length of time that the birds were contained. A longer period of time- more soiling. Regardless of whether these were the Victoria park geese, or stooges made to look like them, they were contained in the trailer then released- still breaking the law concerning the release of this “non-native” species. THIS ALSO OF COURSE DOES NOT ADDRESS THE SHEER DECEIT OF THOSE WHO WISHED TO SUGGEST THAT THE BIRDS WERE BEING “RELOCATED”- BUT IT STILL REMAINS MY VIEW THAT THEY WERE- AND THERE IS MORE RECORDED EVIDENCE WHICH SUGGESTS THIS.